If you’re one of the lucky ones who’s makeup will be professionally done, we definitely suggest bringing cutouts, pictures, ad screenshots of your fav looks and dream face. Remember ladies, your make-up artist is not a mind reader! A sultry smokey eye to you might be Selema Gomez gracing the covers of Vogue, but to your make-up artist it’s Jenny Humphrey circa Gossip Girl Season 2… Not even a doggie filter can save that *Shudder*. Luckily for you, we’ve gathered some of our favourite makeup looks from natural to full glam to show your makeup artist. You can thank us later. This one is for our golden goddesses. With just a hint of shimmering gold peeking over the top of the eyes, this look is both heavy on the bronzer and the highlighter. Keep your lips neutral to emphasise your golden eyes. Dark and sultry, these eyes were made for the night. Release your inner femme fatale with thick, bushy brows, and layers of eyelashes. The ultimate smokey eye, this look is one for the bold. Consisting of hues of gold and brown, and emphasised with a heavy winged eyeliner and plenty of falsies, this smokey eye will instantly glam up your whole look. Brown smokey eyes, and soft dewy skin make up this luxe look. Keeping everything else soft and natural, this look is about making the eyes pop. Add false eyelashes to take this look into the night. Our favourite natural look, this makeup is perfect for those who rarely wear makeup but are wanting something special for formal. This look consists of a soft smokey eye blended outwards, natural eyebrows, and just a brush of bronzing. This look is all about the brows, thick, unkept, and fierce. 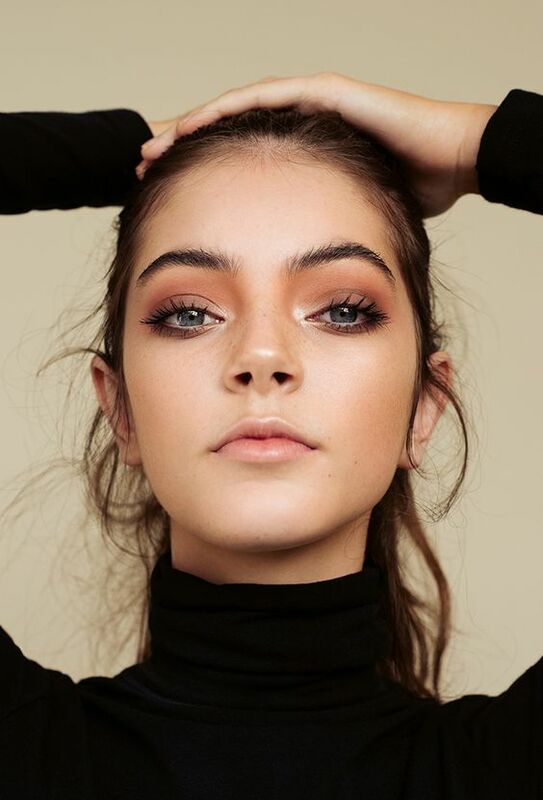 Golden smokey eyes, and plenty of highlighter make up this modern day look. A quick vote around head office has resulted in some top tips and advice that we feel necessary to pass on to your eager little ears. Heed our advice. Remember this is your night, and your face. Don’t feel pressured into doing a look you don’t feel comfortable with. If you can see your makeup artist getting a bit hot and heavy with the eyebrow pencil, tell her to cool it down quick smart. (Insert lecture about pictures). Don’t be afraid to be vocal throughout the process, and regularly check in on their work. Eyes or lips. Read it again ladies… Eyes or lips. Pick one, and one only. You’ll thank us when you’re flipping back through photos in a few years and looking glowing and beautiful and less like a clown (here’s looking at your Melissa). A few days before formal, try and steer clear of any dairy and sugar to avoid and major skin flare-ups and breakouts. Upping your water intake can also help to flush out toxins and will help your skin be clear, gorgeous, and photo ready! There’s nothing like having pluto land on your face before formal night. But if it does, don’t stress – concealer that bad boy up and you’re good to go. Finally, sit back, relax, and enjoy yourself! You only get to go to formal once, so let the pampering begin.